Fuel cells have been around since the early days of NASA and have been a primary source of power for many a mission. Nowadays, closer to home, they are becoming an increasingly attractive source of standby backup or primary power for modular datacentres. One of the mains concerns for large scale datacentre operators over the last few years has been how to provide their IT facilities with clean energy at guaranteed future pricing. Investments in solar PV farms and wind turbines, hydro and geothermal energy sources have to be done on a scale that can only really be financed by mega datacentre operators such as Google, Facebook and Apple. 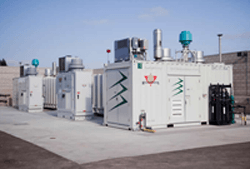 However, the power horizon is changing with a rapidly advancing power generation technology that could one day become the standard for modular datacentres. It is one that can be used a primary power source or as an emergency source of power for an uninterruptible power supply. The technology is that of the ‘fuel cell’. Hydrogen powered fuel cells are more common than people are aware. In cities like London they are safely used to power buses and deliver zero emission transportation. In modular datacentres, fuel cells when combined with modular UPS systems may also be the perfect choice for ‘Colo’ datacentres because they allow power protection to be right-sized to suite IT demands. That is, scaled vertically as the need comes to power more server racks to meet client demands. The principle of operation of fuel cells relies on an electromechanical process, forcing a gas through a catalyst membrane to generate electricity. There is also a by-product whether the fuel is pure hydrogen or natural gas. For hydrogen fuel cells the ‘waste’ product is water, for natural gas fuel cells it is carbon dioxide but on a lower scale than say coal fuelled power stations. The catalyst itself typically uses precious metals like Nickel and is one of the key cost components. Several key factors are driving the fuel cell revolution within the datacentre market (as well as elsewhere). The price of fuel cells is dropping. This is partly down to innovation and research into less costly catalyst materials and construction and also some scale economies as fuel cell technology becomes more widely used. Electricity costs are also rising combined certainly in the UK with a less reliable electricity distribution grid as power generation capacity falls. Some are forecasting parity with more carbon intensive power generation in the years to come. From an infrastructure point of view fuel cells can also benefit from local facilities and distribution. Hydrogen can be stored in specialist cylinders and delivery systems on-site with companies like BOC providing a well-known gas bottling service including delivery, collection and refill. For natural gas powered fuel cells, datacentres can be constructed near to grid connection points or facilities that produce gas as part of their operation like biogas plants. Based on size, either approach may be less costly, more energy efficient and environmentally friendly than a traditional diesel powered generator or sealed lead acid battery sets which have their own short life expectancy and replacement cycles (3-5 or 7-8 years when used with a UPS system). What makes fuel cells appealing for modular datacentres is also the fact they are modular designs themselves. To operate as cost effectively and efficiently as possible every aspect within a modular datacentre has to be right-sized to meet the demands placed upon within a given time frame. Modular UPS systems allow this and the modular build of fuel cells is complimentary to this approach. Both modular UPS and modular fuel cells tend to scale vertically. In summary fuel cell adoption by smaller and modular datacentres is becoming increasingly attractive, especially when coupled with a modular UPS system. Their life expectancy of 15-20 years is also appealing when it comes to finance options and they offer probably the most eco-friendly approach to power generation when fuelled by hydrogen. Whilst specialist skills are required to deploy either a hydrogen or natural has powered fuel cell within a datacentre environment, simply put it isn’t rocket science…any more.